Recursive Stage 2, originally uploaded by Roberta Warshaw. I can totally see how Grant Diffendaffer is addicted to making these recursive things. I call them recursive things because they can be a bead, a pendant, or just a tool in themselves. I cannot get over how very different these two objects are. The top piece was created by inverting the cured bottom piece into raw clay and pushing down pretty hard. The raw clay needs to be thick enough to accommodate the entire cured piece. I just cannot get over the difference in the positive and the negative. Turtle Parade, originally uploaded by Roberta Warshaw. I just had to share this wonderful shot I took today while on a lovely spring walk to Hall's Pond here in Brookline. The turtles were just so adorable all lined up like that. One more is bringing up the rear still in the water! Happy accidents, originally uploaded by Roberta Warshaw. Many years ago there was an artist on public television named Bob Ross. Whenever Bob made a mistake on a painting, and it turned out well, he called it a "happy accident". Well that is what happened to me yesterday in my studio. I was hitting a wall, as I am known to do. I had just ruined a batch of beads due to not knowing what I was doing:)) So I decided to make some texture plates with these wonderful Chinese metal type characters I bought on e-bay. Lord knows I have enough scrap clay to fill a steamer trunk! Well, the texture plates turned out rather well. I baked them and set them aside. I had bigger fish to fry. I was in a stripe mode since I very much liked the way the light colored stripes came out on the ruined beads. So, I tried it with gold, black and translucent. Unfortunately I didn't like the way that looked at all. And I had made a big striped ingot too. Now what? Mush. That is what! I mushed it all together and thought I had more scrap for texture plates. But wait...what is that color I made? Bronze. That is what. A most lovely bronze color emerged from the scrap clay. So with texture plate in hand, bronze colored polymer clay in the other, I made these beads. I also smudged a bit of Pearl Ex gold powder on them. The dome will be the front. The flat part the back. So they will be hollow. If I don't ruin them in the finishing that is. I do that. A lot. Chihuly Exhibit @ DeYoung Museum, originally uploaded by chrisheuer. Photo copyright by Chris Heuer. What a wonderful way to celebrate the first nice, sunny day in a very long time. 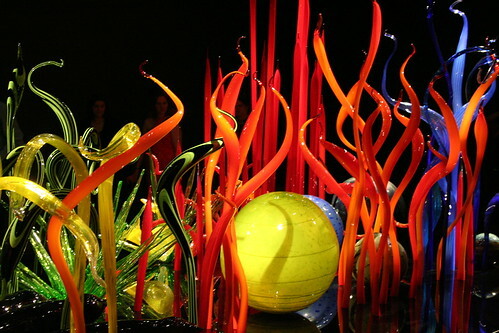 We walked over to the MFA to see the new Chihuly Exhibit. Today was the members only preview but we still stood in line for hours to get in! It was absolutely worth the wait. The dark background in the gallery really set off the colors. And oh what colors! The reds were so.......well....... RED! Deep alizarins and bright, highly saturated cadmium reds! Luscious! There were some pieces where he used more earthy tones, which is something I hadn't seen before in his work. One chandelier was all muted ochres, browns and beiges. Some of the newer baskets were a cloudy ecru color. Still breath taking. The pieces were all staggering in their beauty. Each more than the next. All I could hear around me were people gasping at the immense beauty of it all. To see all that color in one place after the many, long grueling months of gray days! A feast for sore eyes as they say! The above piece was titled Mille Fiori. I was inspired by both the shapes and colors, Especially the way he uses simple stripes in many of the stems. Stripes are something that work well in polymer as well. Maybe some of this beauty will rub off on my polymer work. I can only hope.